The headwaters of the Kern is fed by snowmelt from Mt. Whitney. The Main Kern and the Little Kern combine to make what boaters now refer to as the Forks of the Kern. The Forks is part of the federally protected Wild and Scenic Rivers system and it is most definitely wild, scenic, and remote. The hike in to the river canyon is a 2 mile hike that commercial outfitters hire mules and porters to help them with, but some private boaters opt to save a few bucks and carry their own gear. Once you get into the canyon, you will enjoy, (or be terrified by), 17 miles of pool-drop Class IV, IV+ and V rapids. Most people take 2-3 days to do this run, allowing for time to enjoy the scenery and scout rapids. 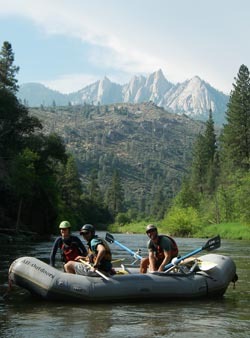 Kayakers who know the Forks of the Kern will sometimes “bomb down” in a day. Very few people ever venture above the Forks of the Kern, but there actually are runnable rapids in the Headwaters section, which flows from high Sierra peaks including Mt. Whitney. The Headwaters run involves too much portaging and backpacking with a kayak for most people, but every so often a group ventures out there. Read one of just a handful of Headwaters of the Kern stories. The whitewater is some of the best Class IV and V California has to offer. Folks have been commercially rafting on the Forks since 1980 when Bill McGinnis and Jim Cassady proved to the Forest Service that all the rapids are runnable. Nearly 30 years later, the whitewater is still just as thrilling. You know the rapids are frequent and exciting when even some Class IV’s remain unnamed. Unless you are with professional guides who know the way, be prepared for and make time to scout many of the rapids. Class V rapids such as Westwall, Vortex, and Carson Falls will make your heart pound and your hair wet. And there are plenty of fun and challenging Class IV-IV+ rapids in between. With side creeks cascading into the main river, pine-studded hillsides, and views of The Needles granite formations there is plenty to soak in while you’re not transfixed on the tremendous feat of navigating the whitewater. Creeks such as Dry Meadow creating beautiful waterfalls as they plummet into the Kern River. The Forks of the Kern is located deep in the Golden Trout Wilderness Area, named after California’s state fish. The nature of the pool drop rapids is such that fishing is excellent in the pools, depending on the water levels.